What limiting beliefs and behaviours are holding you back in life? Are you feeling ‘stuck in a rut’ and don’t know how to move forward? Are you sick of your constant negative thinking? Are you frustrated by your destructive self-sabotaging behaviours? Do you feel like you never reach your goals or desired outcomes in life? Do you want to improve your performance in certain aspects of your life? Neuro Linguistic Programming (NLP) is the study of what actually works in thinking, language and behaviour. It is a way of coding and reproducing excellence that enables people to consistently achieve the results that they want. NLP demonstrates how through using our senses we are only able to perceive a small part of the world. Our view of the world is filtered by our biology, experience, beliefs, values and assumptions. We act and feel based on our perception of the world rather than the real world. NLP calls each individual’s perception of the world their ‘internal map’. 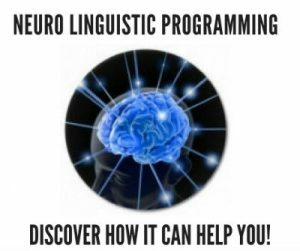 NLP shows how our mind-body (neuro) and what we say (linguistic), interact together to form our perceptions of the world, or internal maps (programming). Each person’s internal map of the world determines their feelings and behaviours. As an approach to personal development or therapy NLP involves understanding that people create their own internal map of the world, recognising unhelpful or destructive patterns of thinking based on impoverished maps of the world, then modifying or replacing these patterns with more useful or helpful ones. NLP demonstrates that a person can develop successful habits by amplifying helpful behaviours and diminishing negative ones. It allows you to change, adopt or eliminate behaviours, as you desire, and gives you the ability to choose your mental, emotional, and physical states of well-being. It’s about showing individuals that we have more choices. Using visualisations, linguistic tools and communication techniques that speak directly to the unconscious mind, we are able to “re-wire” or “re-program” the mind, leaving you in control of your behaviours and thoughts…not the other way around. Limiting beliefs and behaviours hold us back from experiencing life in all its fullness. Sometimes it feels like we’ve tried everything and so we resign ourselves to the circumstances and continue our internal struggle. Habits in our thinking and behaviour are nothing more than pre-conditioned ways of responding to certain situations. NLP is a process of modelling the conscious and unconscious patterns that are unique to all of us, in such a way that we are continuously moving toward a higher potential. We run our lives by strategies, in a similar way that a computer uses a program to achieve a specific result. By understanding the strategies by which we run our lives, we can then choose to do more of the same and keep getting the same outcomes, or choose to change our strategies to enhance our potential and individual excellence. Success comes from within and our success depends on our ability to be excellent in everything we think, say and do. NLP provides us with ways to achieve this through numerous techniques and processes. Neuro Linguistic Programming Coaching is different from conventional talk therapy in that it focuses more on ‘how you think’ rather than ‘what you think’. It is solutions-focused, and is NLP Coaching is typically of shorter duration than traditional psychotherapy; with NLP we focus on moving from the present towards the future, in contrast to many forms of therapy that spend a lot of time focusing on the past. NLP Coaching is the process of accessing both internal and external resources and utilising those resources to gain momentum towards the outcomes you desire in life. NLP Coaching is for those people who want to move beyond their present circumstances and past conditioning by taking greater levels of responsibility for their lives, removing internal obstacles and limiting beliefs, and discovering many new choices and possibilities after challenging their ‘old ways of thinking’. By purposefully ‘moving things around’ inside your head, we can quickly and dramatically change your perceptions and perspectives, and this can radically change the way you operate, and consequently the outcomes you get! Identify exactly where you are now and where you want to be moving forward; helping you to explore, understand and clarify what it is you really want and tapping into the real reasons WHY you want it, ensuring that the reasons are really aligned to YOUR VALUES! Identify the internal obstacles and limitations that are holding you back; your underlying beliefs and unhelpful psychological patterns that are preventing you from taking positive action and achieving what you want. Work directly with your conscious mind to increase your awareness of your true values, current thoughts, belief systems, emotional states, and behavioural patterns, identifying your current disempowering beliefs and false perceptions that are holding you back. Then work directly with your subconscious mind utilising cutting-edge techniques including Neuro Linguistic Programming (NLP), Hypnotherapy and Emotional Freedom Techniques (EFT). Internal conflicts occur when your conscious and your subconscious minds are not working together. Imagine your brain as a ship where your conscious mind is the captain and your subconscious mind represents the crew. The captain may wish to direct the ship in a certain direction, but if the crew aren’t working with the captain…well there’s mutiny! Finally, with a clear vision and destination, and with the old roadblocks out of the way, we’ll then develop practical goals and an action plan or road map to clearly map out how you will bring your desired future into your present! By the end of your 14 week program you will have the clarity, the confidence, and the plan to move forward in life and to start living the life you truly desire! In fact we are so confident that you will find this program both comprehensive and valuable, that we offer a full 100% money back guarantee! If at the end of your program you are not satisfied, and you have completed all set tasks and have attended all scheduled appointments, then we will refund your money in full.